Having your boat ready to take out on the water whenever the mood strikes you is one of the biggest advantages of owning waterfront property in Topsail Beach, North Carolina. However, storing your boat in the water has disadvantages as well. Long-term saltwater exposure can result in a variety of costly problems, including corrosion, blistering, and organism growth on the hull. However, with a boat hoist from DECO Boat lifts, you can enjoy all of the benefits of your waterfront lifestyle without any of the drawbacks. Why Turn to DECO Boat Lifts for a Boat Hoist? Maxi Lift – Our entry-level system is highly affordable yet has a heavy-duty aluminum flat plate drive capable of hoisting up to 16,000 lbs., making it a great option for many different types of boats. DECO Lift – This is our most popular lift, and for good reason. Its smooth and powerful lift operation is whisper-quiet and offers industry-leading reliability thanks to our proprietary sealed gearbox design. Concept CRS Lift – Loaded with the industry’s most advanced technology, this lift offers unrivaled performance. A direct drive achieves incredible lift power without the use of pulleys, chains, or belts. Plus, it comes standard with our patented Cable Retention System (CRS), further reducing maintenance by minimizing wear to cables. Are you ready to enjoy all the convenience of your waterfront lifestyle in Topsail Beach, NC, without having to worry about the harmful effects of saltwater? 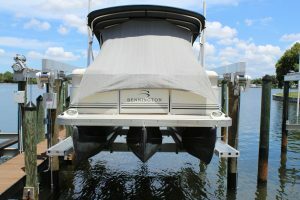 Contact DECO Boat Lifts to learn more about our boat hoist systems today.